Since I started interning at PRK, I have become a big fan of the health food bloggers. They always innovate, and this inspires me to branch out in the kitchen, especially when it comes to how I eat my veggies. A while back I noticed that Tina of Carrots ‘n’ Cake would not stop raving about kale chips. I had never had kale before, but I was pretty damn sure no leafy green could ever make a good substitute for potato chips. Despite my initial stance against the idea, Tina’s recipe kept following me around, haunting me. Kinda scary. I knew kale was good for you, but still I was skeptical. Eventually, after reading the Siren calls on other blogs (KERF, Always Order Dessert, more CnC), I caved. ENOUGH! I’ll try them. The first time I made kale chips, I was nervous. I took my time looking through some of the recipes I had seen online and finally decided I would season with both salt and parmesan cheese. I wanted to like them, to take one bite and swear by them FOREVER. But you can’t win ‘em all. It was an over-seasoning disaster. The first batch was so salty I was parched for days. But I decided the chips had potential. My thirst for water turned into a thirst to get it right and master the healthy chip. I never thought these chips would become a mission of mine, but life can be unpredictable. After my first attempt fell short, I was determined to create The Perfect Kale Chip. Whether it was too much salt or too little time in the oven, something kept going wrong. But, as the saying goes, the third time’s a charm. My third shot at kale chips came out exquisitely crisp, with just the right amount of seasoning. Three simple ingredients are all you need. First, kale. Grist suggests using Tuscan or dinosaur kale for a slightly more bitter chip, curly kale for a slightly sweeter chip. My grocer usually only carries the curly kind, so I went with that. Second, you need EVOO. Lastly, sea salt. Some recipes suggest using nutritional yeast or a grated cheese like parmesan or Asiago for added flavor. After over-seasoning with salt and parmesan cheese my first time, I stuck with just salt. 1. Wash and THOROUGHLY dry your kale. 2. Tear the leafs from the thick stem and rip into chip-sized pieces. 3. 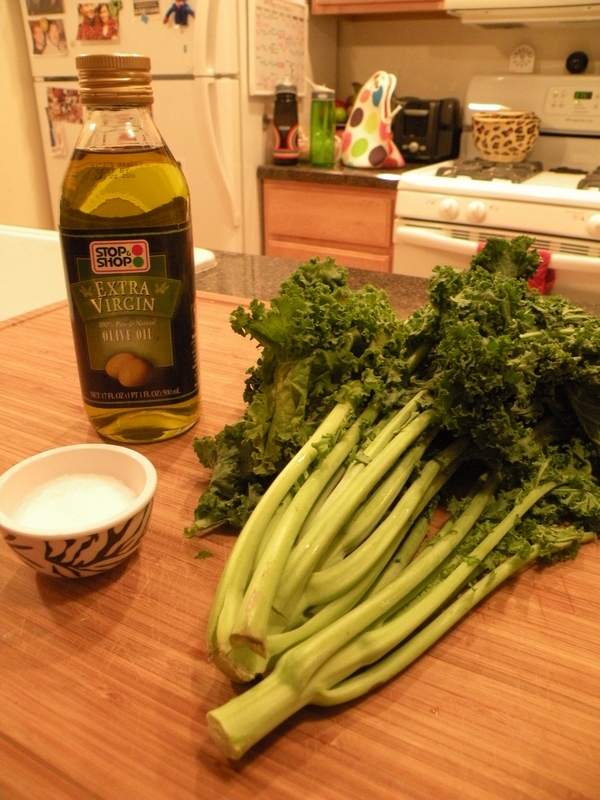 Coat the kale with a tablespoon or so of EVOO. The best way to coat evenly is first to drizzle oil over the kale and then dig your hands in there and really massage the oil into the greens. 4. 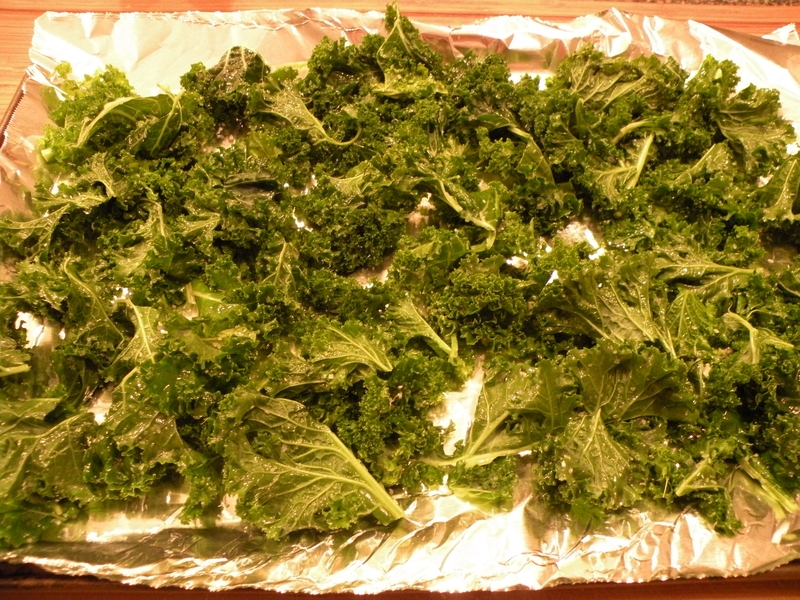 Spread the kale out on a baking sheet and sprinkle with sea salt and any other seasonings. 5. Bake the kale chips at 350 degrees for 20 minutes. If you’d prefer a crisper kale chip (like I do), add an extra 3-5 minutes onto the baking time. Remember: the volume of kale is significantly reduced after baking, so make sure you take that into consideration when deciding how much you think you may need. While I prefer to eat them plain, Kath Eats Real Food likes to dip hers in ketchup. Kale chips also hold up for a couple of days so, in my opinion, you don’t need to eat them right away. I usually keep mine in a Tupperware container in the cabinet for a couple of days. If they stick around that long. Kale chips are delicious and there is no denying the health benefits of this particular leafy green. I am not sure they will fully replace real potato chips in my life (hail Buffalo Bleu Kettle Chips! ), but variety is the spice fo life. Have fun getting hooked. This entry was posted in Public Radio Kitchen on April 23, 2010 by Abby Elizabeth Conway. I find them way too salty. Plus, after a day or two of them being in the tupper ware that is hidden in the back depths of your kitchen cabinets be prepared for a powerful aroma to come bursting forth from within when you open it up. It almost knocked me out the first time. Kale chips are pretty tasty though. Definitely better for you than chips, but I still love my salt and vinegar. Or PEPRONCINIS!! !